I found another 1970s crackpot genius to read about, and I’m pretty excited about it. I got turned on to Stafford Beer through Matt Webb’s blog, which I found through Adam Greenfield’s blog. I’m not even sure who this Matt Webb guy is but he’s clearly a genius and totally worth reading. Right now I have “Platform for Change” via Brooklyn Public Library’s trusty Interlibrary Loan Department, and this book is blowing my mind, particularly in the context of my last post. I wrote yesterday about Luis Von Ahn’s interest in “’human computation,’ the art of using massive groups of networked human minds to solve problems that computers cannot.” I wrote that it freaked me out that from a media ecology perspective this implies that social computing is building a giant collective superbrain. Stafford Beer had a really interesting way of regarding everyone’s brains as individual computers, and I wonder what his thoughts would be about harvesting their collective power via social computing. The quote really points toward a need for the creation of this superbrain; it anticipates Web 2.0. If you cannot add storage to or edit individual brains, we need to upload them all to one place and create something more powerful. I’m excited to read more of this book; I’ve really only just started it. It is full of off-the-wall ideas. One of Beer’s other accomplishments, or near accomplishments that I have to mention was the creation of Cybersyn, a computer network that was supposed to run the Chilean economy. Check out his “lair”, this control room is amazing. 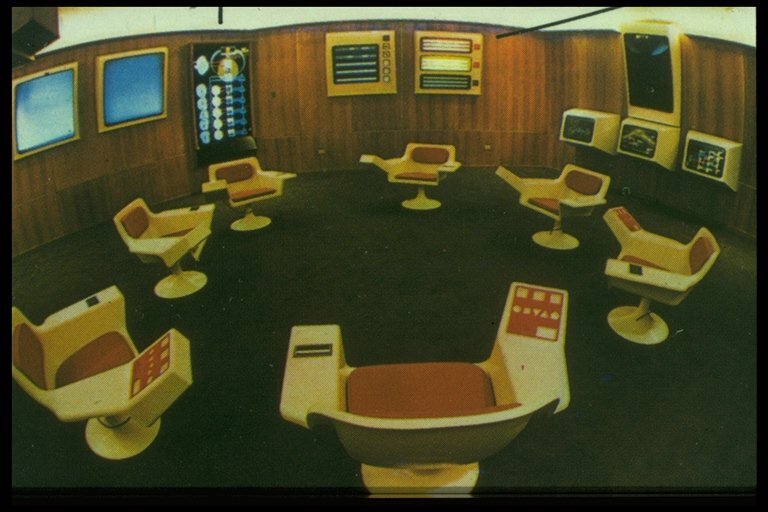 Read more about Cybersyn here. Could this be another example of looking to the past to solve the future’s problems?